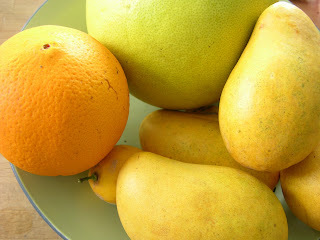 Up until a few months ago, I was under the impression that there was just one type of mango (you know what I mean). But then Whole Foods started whisking out displays of fruit, some large and green, others small and yellow, all of which looked nothing like the standard mango selection I was used to. Last week I tried a variety called the Champagne mango, and I am completely addicted. In fact I just went back yesterday to get some more, ‘cause at a buck a piece, it’s like they’re giving them away. Seriously, these little guys just melt in your mouth like butter. I bought a few over the weekend to infuse in tequila, but after I tasted the fruit, I almost hated to use them. These mangos are grown in two regions of Mexico: Chiapas and Nayarit. Apparently the fertile volcanic soil makes them happy. Really happy. So leave those mangos at the Safeway alone, and try something new.